The location of this beautiful two-story three bedroom house is unbeatable. Casa Katarina is located at the entrance of the gated community of Playacar phase 1, only two blocks from the beach and one block from the charming outdoor shopping mall Paseo Del Carmen and 5th Avenue with all the shops, restaurants and nightlife. The master bedroom has a king size bed, walk-in closet, access to a private bathroom and balcony. The second bedroom has a king size bed and the third bedroom has two twin beds. The spacious dining room and living room areas easily accommodate eight people. The spacious family room has a large satellite flat screen TV and a comfy couch accommodating six people. The living room has two comfy couches overlooking the pool. The spacious dining room has seating for eight persons. The kitchen is fully stocked with all the necessary appliances such as refrigerator, stove with oven, utensils, microwave, coffeemaker, blender, toaster and drinkable water. When you are not swimming in the private pool you can use the free tennis courts as part of the gated community or take an evening stroll among ancient Mayan ruins just a block away. For properties in this area, please visit our website and find us on Point 2, Facebook and Youtube. 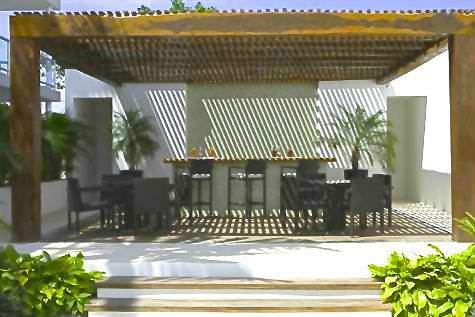 The 28 unit luxury boutique development, Oasis 12, is located on Calle 12 and Avenida 20 in the vibrant caribbean town of Playa del Carmen, Mexico. Oasis12 is elevating the real estate market of Playa del Carmen to a new level by offering expansive floorplans, bright and airy units with private terraces. This development stands out in its intelligent design and unique residence features, taking pre-emptive measures for comfort and security, intellectual and physical at all levels. 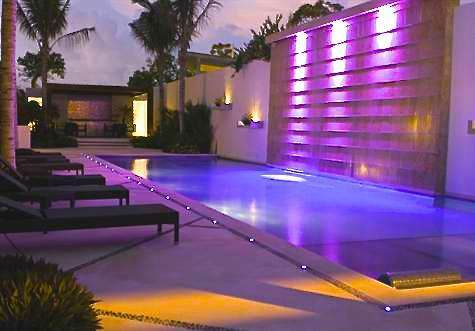 The common areas feature lush tropical landscaping, a pool with waterfall lit up in soft colors at night, creating a unique cosmopolitan ambiance true to Playa del Carmen and the Riviera Maya, Mexico. With closing and delivery of titles and residence within 30 days of signing a promise to purchase agreement, Oasis 12 is one of the securest investments available in the Riviera Maya and Playa del Carmen. Oasis 12 offers customized transactions to each buyers individual needs, from optional developer financing and other benefits, Oasis 12 is your investment opportunity for elegance, luxury and lifestyle. Unit 403 is located on the fourth floor and offers 1545 interior Sq Feet and a sun roof with 1073 sq feet, it is equipped with Full kitchen Quetzal, Washer and Dryer, GE Profile Stainless Steel appliances and much more are just some of the amazing features this condo offers in addition to its sun roof & beautiful terrace with Jacuzzi on the roof. Oasis12 offer 24/7 private security, Elevators, Underground Parking, Gym, Swimming Pool, Common Areas wit BBQ and much more. Great Location, just a quick walk to the beach! Definitely one of the best deals in Playa del Caremen real estate these days! For limited time this unit is available at 285k! Built by one of the best builders in town, this condo boast a great design, a spacious floor plan, including a rooftop pool with an ocean view, underground parking, high rental potential, and is located just a few steps to the beach and 5th Avenue. Ask about cash discounts, and click here to see more photos of this spectacular unit. For more properties in this area, please visit our website and find us on Point 2, Facebook and Youtube. 2 Pools and Lots of Tropical Vegetation! Are you a couple looking for a perfect retreat and looking to buy real estate in best location in Playa del Carmen? Do you want to spend less than $250,000 USD and be able to live in a first class development with 2 pools, lots of tropical vegetation used in the landscaping, within a 5 minute walk to the beach? Well this Playa del Carmen property has your name on it! Located in the popular area of Mamitas beach, this unit in in a building that features underground parking and private storage. Enjoy a luxurious bathroom design with a bathtub included. This unit is also perfect and an income property and if you want to consider renting it out, you can hope to receive a very good return on your investment. This is definitely a condo for sale in Playa del carmen that could definitely be the right choice as and investment for you. Most developers would have build this particular condo as a 2 bedroom, but in this particular case the space of a potential 2 bedroom property was used to design a very large and spacious apartment with 1 bedroom only. You have to check out the pictures here to get the right idea. Priced at just $252,000 USD, this unit stands at 970 square feet. Let me show it to you! Contact me now for a showing. Safe and spacious complex with 2 huge pools! You’ve got to check out this listing. This amazing condo for sale in Playa del Carmen is located right in the middle of town, and less than a 5 minute walk to 5th Avenue in the Mamitas Beach area. You can find 1,2 or 3 bedrooms here in this beautiful development and we do our best to get you 3-4 year financing with 35% down payment. This is the perfect place for families, a calm retirement or vacation, easy to rent out and very much the best Caribbean life style can offer! Priced at $287,900 USD, you can’t wait! This price for this location is practically unheard of, so if your on the fence, give me a call to talk about it. Featuring 2 stories with 2 bedrooms and 2 bathrooms and 1,711 square feet of living space, you have got to see it to really feel what it would be like to live or vacation here. Enjoy the huge pools, underground parking, included gym, reception area, nice gardens and apartments offering generous floor plan with lots of daylight, open floor concept and first class finishings. Great rental potential! Click here to see more pictures and to go directly to the listing. Playacar Home For Sale is Back on the Market! Back on the market! Act quickly! You’re in luck!!! Unfortunately the last buyer could not realize their financing, so this beautiful home is back on the market. It wasn’t on the market for even 2 weeks before it was scooped up and taken off the market, and lots of inquiries for showings had to be declined, so please be fast now. This beautiful Mexican Hacienda Style home is located in a gated community inside Playa del Carmen. With 24/7 security, perfect landscaping, tennis courts, pools with Palapa, access to an exclusive beach club, living in Playacar has great advantages. This house measures approx. 2,200 sqft, is built on a 3850 sqft lot, offers a beautiful view from the terraces, lots of closet space, beautiful designed kitchen with granite counter tops. You cannot beat the price of 310,000 US for Residential Real Estate in the most exclusive neighborhood in Playa del Carmen! Click here for more pictures. With the weekend coming, I can imagine that most of you would like to join us on our Sunday trip to one of the best beach clubs in Tulum. As a little reminder of the fact, that you sometimes find the best bargains here in Playa del Carmen after the high season I like to send you this great listing. Here we have a duplex home, where you have a 2 level house with a extra 1 bedroom penthouse on top. 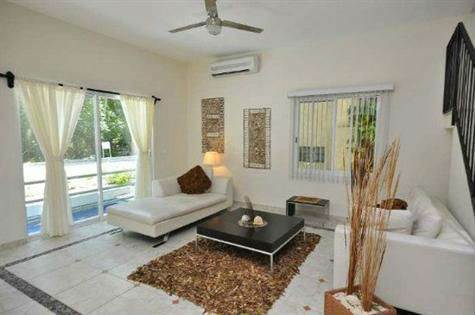 Very nicely done and in a beautiful complex, within walking distance to the beach! You can make 2 rental incomes at the same time here. Basically you either rent long term or use as a vacation rental, but you might be surprised that you would probably make the same income than with a 400,000 US Condo with an ocean view, except you would only have to spend half the money. Also, don’t forget to ask us about the possible development, that foreigners will soon not need a bank trust anymore…which not only saves a bit of money, but definitely will come with a huge increase of foreigners buying real estate here in Mexico! 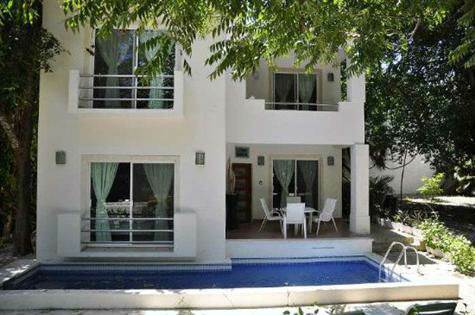 Click here to see more photos and find out more pertinent information about this opportunity for some of the best Playa del carmen real estate. This one is a special case!